Will you contact my GP (medical doctor). We will contact your GP, with your consent, whenever we think it necessary or upon your request. What happens once I feel better? Sue and Steve strongly recommend maintenance treatments about once every three months to maintain a healthy balance and help avoid future problems. Can I have a free assessment? 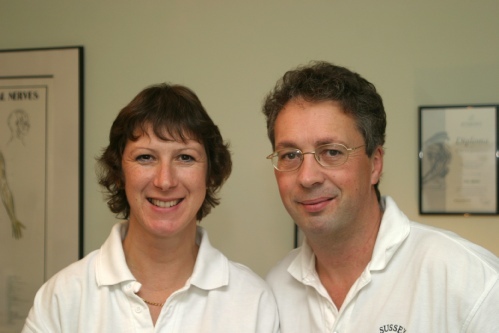 Yes – Sussex Chiropractic offer a free chiropractic assessment before treatment commences. Reduced fees for children & young people in full time education. First appointment £45, subsequent appointments £30. Most private medical insurance will pay for Chiropractic care, you should check your policy and speak to your insurer. We are recognised by most insurers, including BUPA, AXA-PPP, HSA and Norwich Union. Monday to Friday 8:30am to 6pm with some evenings and Saturday morning appointments by arrangement. EMERGENCY appointments can often be arranged out of normal hours, including weekends. A £10 supplement is payable for appointment out of normal hours. Emergency home visits can be arranged, although there may be an additional charge. When a home visit is required we request that you have a friend or family member present. Parking - On Site Parking is easy and free.